The fully renewed Park Hotel Gyula awaits its guest in picturesque surrounding, opposite to the famous Castle Bath (Varfurdo). Thanks to its beautiful panorama and excellent services the Park Hotel Gyula offers pleasant leisure facilities to the guests wishing to relax. 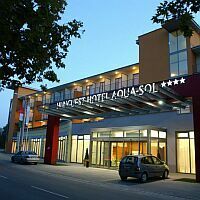 The 4-star spa hotel - Hunguest Hotel Aqua-Sol - is located in Hajduszoboszlo, referred to as „Mecca of rheumatics”, where the world-famous medicinal thermal bath has been receiving guests for 70 years. The hotel with its newly-built medical section offers treatments through the whole year. The newest 4-star hotel of Hajduszoboszlo named Apollo Thermalhotel & Apartments is located only a few hundred meters from the thermal spa of Hajduszoboszlo and the Aquapark. The wellness area of the hotel helps you dicrease the stress and escape from the bustle of everyday life. The hotel restaurant with show kitchen awaits guests with characteristic flavours of the Hajdusag and Hortobagy. The Aquapark of Hajduszoboszlo offers a special kind of entertainment for visitors. Hungarospa Thermal Hotel*** is situated in Hajduszoboszlo, in the direct neighbourhood of Europe’s largest bathing complex. The 3-star thermal hotel awaits the guests with 117 air conditioned rooms, outdoor and indoor thermal pools, a conference hall seating 120 people and an own therapeutic section. The guests can use free of charge the 13 pools of the open-air baths spread over 30-hectares. 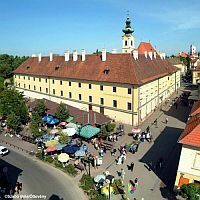 The familiar Pension Marvany is situated in the heart of Hajduszoboszlo, only 5 minutes walk from the thermal bath. The medicinal water of Hajduszoboszlo is suitable for the treatment of several groups of disorders. Pension Marvany offers 14 twin rooms. In order to preserve the health of the guests, all beds are equipped with Cardio therapeutic mattress. The familiar restaurant of the pension offers Hungarian specialities. Hotel Hoforras awaits its guests in the distinguished area of the spa Hajduszoboszlo, lying only 500 metres from Hajduszoboszlo Health Spa. The 3-star hotel has its own medical section with rheumatism clinic. 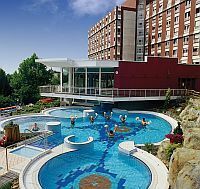 Within the spa hotel indoor thermal pool, swimming pool, thermal pool and children’s pool are available. Restaurant Hőforrás serves an excellent selection of Hungarian and international specialities. 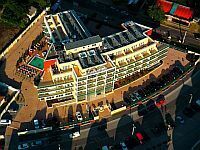 The Hotel M, opened in 2007 is situated in Hajduszoboszlo, next to the famous spa and Aquapark, in greenbelt environment. In the full air-conditioned building, a wide range of services provides your comfort. Intimate wellness department, a specific massage center and exclusive facultative programs guarantee your spiritual and physical freshness. Hotel Drava Thermal Resort **** thanks to its favourable location unites the advantages of the wine hills of Villany and the thermal tourism of Harkany. The thermal hotel near the Thermal Bath of Harkany has 88 air conditioned rooms and suites with balcony offering wonderful panoramic view on the Villany Hills. The up to date wellness centre provides a large scale opportunity for regeneration and relax. In the hotel restaurant guests can enjoy Hungarian specialities and international dishes as well. 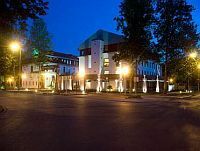 Hotel Drava Thermal Resort **** offers a perfect location for company or private events in its three connecting well-equipped conference rooms. The newest conference and wellness hotel of Central Hungary, the four-star Abacus Wellness & Business Hotel is located in Herceghalom, just 15 minutes drive from Budapest. The ABACUS Spa center of Abacus Wellness & Business Hotel offers complete re-generation of body and soul at the highest level: complete lifestyle programmes, water and sauna world, and whole scale spa-experiences are available for the guests. There are three world-class golf courses within 15 minute drive time from the hotel: the Old Lake Golf Club Pannonia Golf und Country Club, Budapest Highland Golf Club & Akademy.